CompuMed Doesn't Forget... And it Won't Let You Forget! CompuMed Simply Organizes and Systematically Dispenses Your Medications Up to Four Times a Day, Week After Week Without Fail! Have you or a loved one ever forgotten to take your pills, or has been confused as to whether you took them correctly? Are you someone who needs a reminder to take your pills on time, or are you the one who does the reminding? Are unscheduled doctor visits due to medication non-compliance disrupting your household? Are you considering expensive home health care or nursing home placement for yourself or a loved one due to medication non-compliance at home? Have emergency room visits or unscheduled hospitalizations become a part of your life? THEN YOU ARE SOMEONE WHO NEEDS TO KNOW MORE ABOUT CompuMed. 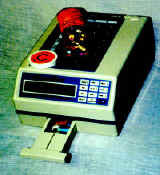 The CompuMed automated medication dispenser is a unique device that addresses the issue of medication non-compliance. CompuMed organizes a week's supply of pills and vitamins in a refillable plastic tray. The tray is locked into the CompuMed machine which is quickly and easily programmed to deliver medications into the removable dispensing drawer. A buzzer sounds continuously until the pills are removed and the drawer is replaced. CompuMed . . . A SIMPLE SOLUTION TO AN AGE-OLD PROBLEM. CompuMed assures the right amount of the right medication at the right time, every time, four times a day, week after week without fail!